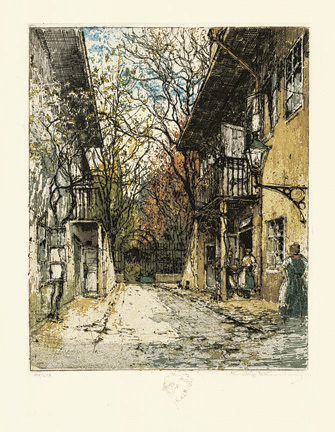 Untitled (Schubert's Birthplace, Vienna) - - c.1910, Color Etching with Aquatint. Edition 250. Signed and numbered 160/250 in pencil. Image size 9 5/8 x 7 13/16 inches (244 x 198 mm); sheet size 18 3/4 x 14 1/4 inches (476 x 362 mm). A fine, fresh impression, with wide margins (3 1/4 to 4 1/4 inches), on cream wove paper, in excellent condition. A remarque profile of Schubert, in brown ink, in the bottom center plate margin. 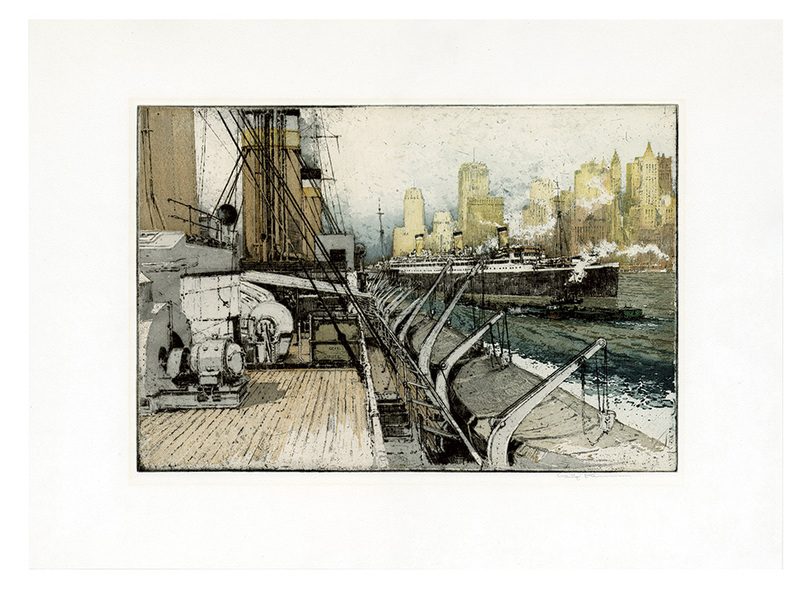 Untitled (Lower Manhattan Docks) - - 1927, Color Etching with Aquatint. Edition 100. Signed and numbered 78/100 in pencil. Dated in the plate, lower right. Image size 17 1/4 x 11 13/16 inches (438 x 300 mm); sheet size 21 5/8 x 15 3/4 inches (549 x 400 mm). A fine, fresh impression, with full margins (1 3/16 to 3 1/4 inches), on heavy cream wove paper, in excellent condition. 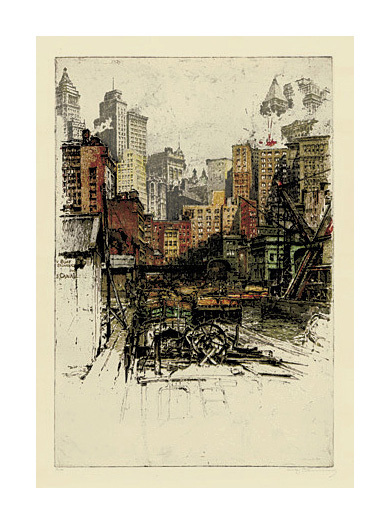 Untitled (New York Skyline) - - c 1930, Color Etching with Aquatint. Image size11 1/4 x 16 3/4 inches (286 x 425 mm); sheet size 17 x 23 1/4 inches (432 x 591 mm). AA superb, early impression with fresh colors, on chine collé, with wide margins (2 3/4 to 3 1/4 inches); slight light toning within a previous mat opening, otherwise in excellent condition.